Due to many people writing to me on individual stock analysis, I am opening a new section here to answer reader’s questions. If you have any questions, please leave the question as a comment or in the chat box. Depending on my time availability, I will respond to your questions. Readers, today was a volatile and news driven day due to budget. However my pre-market analysis yesterday helped gain some good profits today. 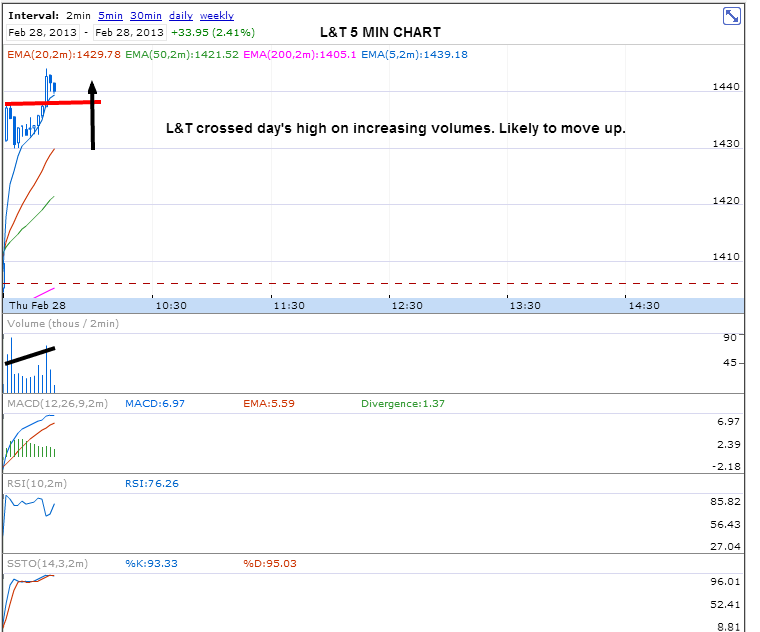 L&T consolidated in the morning and there was a breakout above days high. I alerted the readers here. Could get small profits since the stock started reversing back. 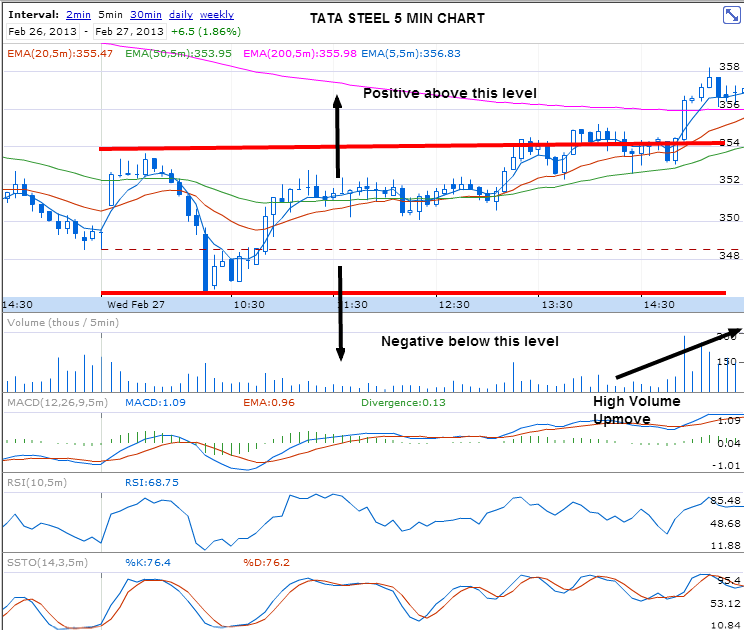 Tata Steel – In my analysis yesterday, I had written that Tata Steel was negative below the level 354. It was also the daily pivot. 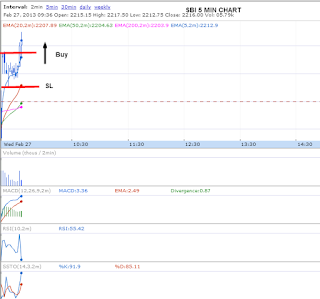 As soon as the stock went below 354, I alerted my readers here and entered the short. Tata Steel fell below 346 which was another selling opportunity and I kept holding the stock till it started bouncing back. L&T, once again if days high is crossed, the stock will shoot up. Those who have not entered until now can consider entering above days high. L&T has crossed the days high and is sustaining. Likely to move up further. Being budget day, it could react sharply on news either side, be careful. Readers, 28 Feb is both budget and expiry day and be ready for high volatility Also it is impossible to predict tomorrows market. So I recommend readers not to trade heavily tomorrow since SLs will be hit on both sides. Those who still want to trade, please keep 1 open position at a time. 1. Tata Steel - Go long above 354 maintaining strict SL. 2. L&T - Go long if the stock is above 1400, SL will be 1380. Below 1380, L&T is a sell. I would like to avoid trading in banking stocks tomorrow, though I will have SBI and ICICI in my watchlist. What to do in case the market is choppy and whipsawing ? What to do in case of a rally ? Pick up any of the pivotal stocks which is consolidating after an upmove and tending to breakout from the consolidation and go long. L&T could be a good candidate for this. What to do in case of a sell off ? Pick up any of the pivotal stocks which is consolidating after a downmove and tending to breakdown from the consolidation and go short. Some of my favorite pivotal stocks are - Tata Steel, ICICI Bank, SBI, L&T, Reliance and Infosys. Wish you good luck. Yesterday I wrote about Tata Steel here and the target of 346. Today Tata Steel hit 346 levels exactly and bounced back to cross the resistance of 354. I entered into buying position today above 355, since this major resistance was broken with volumes. As long as 354 is held , from now on Tata Steel will remain positive. 346 will once again be a very strong support. Below that it could go up to 335, 326 as indicated before. 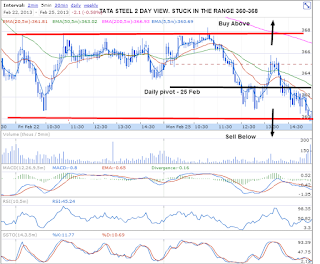 Today Tata Steel fell down from 354 which acted as a big resistance in the first half of the day. The stock touched the support level of 346 today and made a sharp bounce back. I have been writing about this level , in my last two posts. Now the resistance is 354. If Tata Steel holds 354, then it will further move up. L&T is a sell below 1380. If days low is crossed, then it is a strong sell. Today Indian markets crashed due to negative news from Europe and lackluster rail budget. When I write this , US market is rallying due to a positive view from Bernanke on easing measures in US. 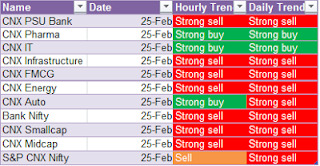 Todays Sector analysis shows that all sectors except IT are negative in both hourly and daily charts. So tomorrow, I will try to trade IT from positive side. Will check if banks are bouncing back and go long on SBI and ICICI Bank. Both these stocks are negative in both daily and hourly charts so, we should book profits on longs quickly and sell on rise. 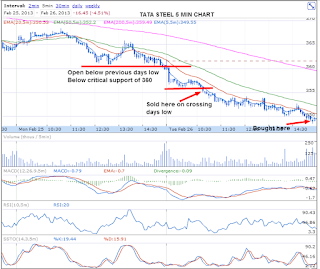 Tata Steel is still negative and I will look for opportunities to sell on rise. Dear Readers, today I had 3 successful trades. Though market opened gap down, both ICICI and Tata Steel gave me good selling opportunities. Read below. In my pre-market analysis yesterday, I had indicated 360 as the critical support, the stock opened below 360 and sustained. On crossing the days low, I entered a short. SL was days high. I alerted my readers here during the day. 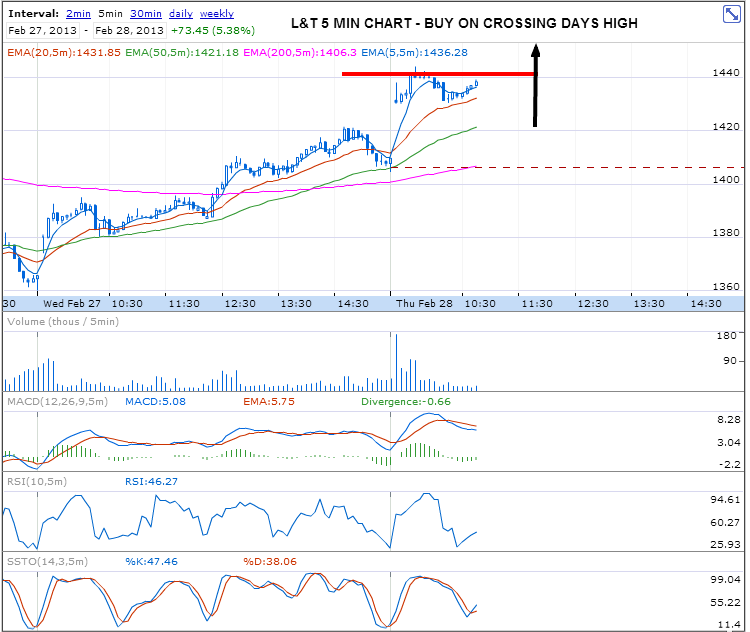 In 5 min chart, 5 MA, never crossed 20 MA. No single candle was fully above the 20 MA. So I maintained short and covered at end of the day. This is a good example of a downward trending stock, where we should maximise the gain by following the trend. Readers, ICICI hit 1050 levels once 1085 was broken. I have been writing about the weakness of ICICI in my last 2-3 days. Looks like as of now the downmove will be limited to 1045-50 levels. At the time of writing this post ,the stock is tending to bounce back. Those who are in profits, keep a trailing stop loss. ICICI Bank has crossed below the support 1090-85 which I have been writing here during the past few days. Now the next stop will be 1060, then 1048. Tata Steel moving down as expected. 360 levels broken convincingly and next stop would be 346 in next few days. Do not carry overnight positions due to budget announcements. Yesterday, I posted my views here in pre-market calls and below is the update. 1. 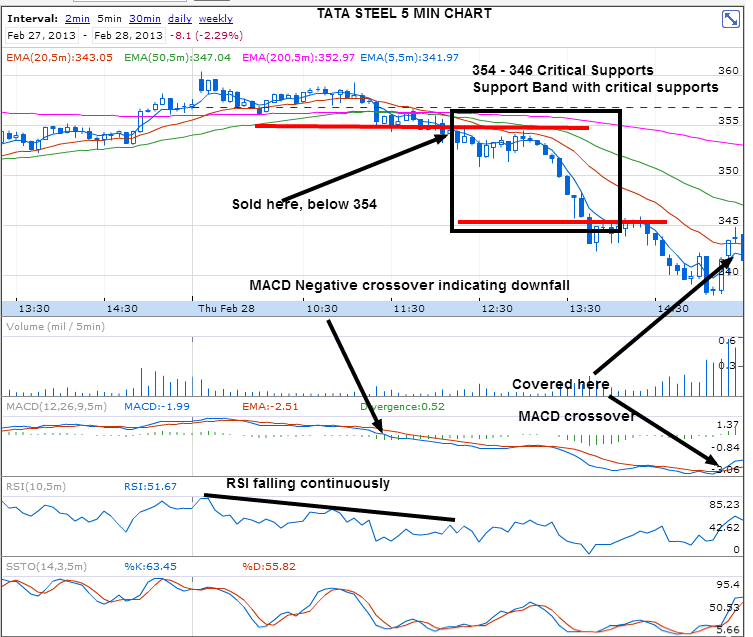 Tata Steel – Range bound between 360 and 368. 2. 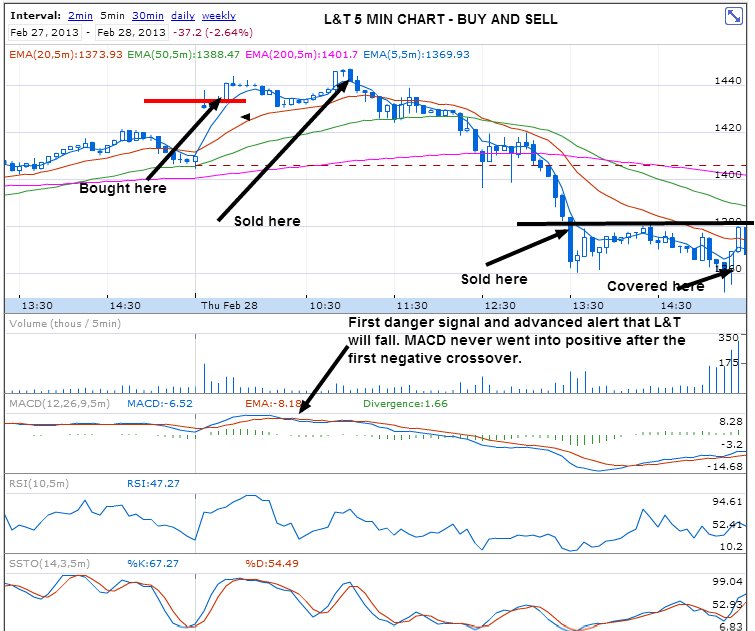 L&T – Sell below 1430 was my view, stock hit 1400 levels. 3. ICICI Bank – Stock bounced from the levels of 1090-85. This is still a support. 4. Bharti Airtel – Ended in negative. No long or short possible as per todays chart position. 5. DLF – Ended in negative, it is bearish now. No longs is recommended. 6. Wipro – Above 421, the stock hit 426. Still positive. 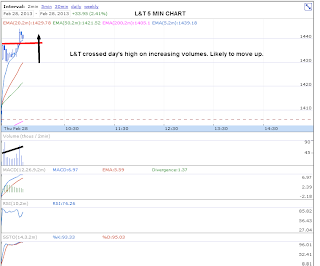 Trading Strategy for 26 Feb.
L&T – Is a clear sell as long as it is below 1415 on Tuesday. ICICI Bank – Still negative, stock is showing some support t 1090-85 levels, no convincing breakdown. Once this level is broken, please short. IT Sector is strong in hourly and daily charts. Wipro and Infosys could be traded on long side ONLY if market recovers after gap down. Pharma Sector is looking very strong. 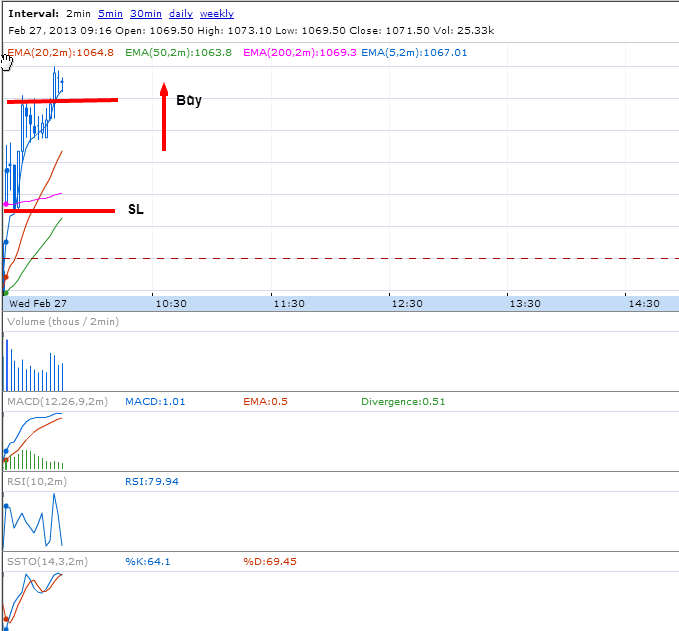 Ranbaxy may be traded from the long side tomorrow ONLY if market recovers after gap down. SBI is below 2200 and staying there. Negative for stock short for intraday / short term. As I had written in my pre-market analysis, 368 is a critical level, if crossed and sustained. Tata Steel will shoot up. 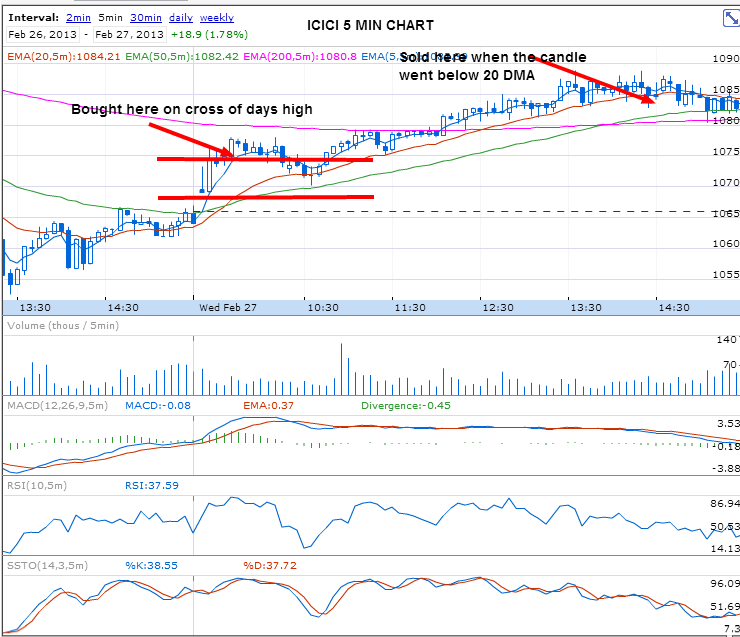 ICICI will move up due to short covering if 1090 is crossed and sustained. Tata Steel is a sell only if it goes below the previous days low and stays there. As indicated in my pre-market post here, 368 is the critical resistance , from there the stock has reversed. Dear Readers, As I have been writing here in the past few days, Nifty and many pivotal stocks, L&T, Tata Steel, SBI, Reliance, ICICI Bank all have fallen significantly. This market is clearly sell on rise, until we see a sustained upmove. All sectors except IT are in sell mode in daily and hourly charts. Will there be a bounce back ? A possibility cannot be ruled out. Hence wait for atleast 20-30 minutes after market opening to start trading. 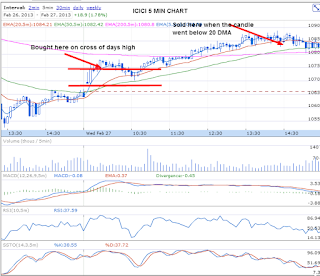 In case of a bounce back, short once the charts give negative signals like MACD bearish cross in 5 min charts. Look at days high, previous days high/low to take decisions. Which stocks to trade ? Which stocks to trade –21 Feb, Short SBI & Tata Steel. Nifty is mildly bullish. In hourly charts, Nifty is still in buy mode, but daily charts is in Sell mode. US Markets have ended weak and Nifty could be weak as well for Thursday. See the sector analysis below. Only IT seems to be very strong. In case you wish to go long for Intraday, select Infosys and HCL Tech. Banking , particularly PSU Banks are weak. SBI and ICICI Bank appear to be weak. ICICI Bank is showing a support and bounce back trend. But if the immediate support of 100 DMA in daily charts is broken, then go short blindly. SBI is likely to move down further. RSI in daily charts of SBI is showing a resistance at 30 levels. (Why RSI can indicate a resistance ? ). Fast stochastics looks like pointing downwards. Tata Steel is again weak. One of my recent favorite stocks for short sell, I covered several articles here about its downfall. 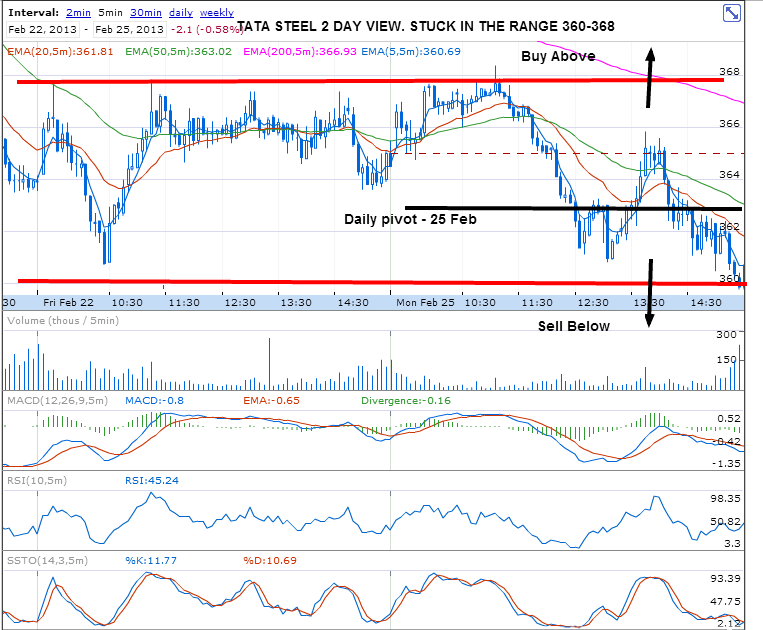 On 20 Feb, Tata Steel tried to reach 15 DMA, but fell down on higher volumes, downmove could continue 374-372-368. RSI is showing resistance at 40 levels in daily charts. Beware of a bounce from 370-368 levels if you are short. If 368 is broken convincingly, then 360-350 is the short term target. Most of the sectors are still in red in hourly and daily charts. Only IT is positive. HCLTech is one stock if you wish to go long today. HDFC Bank made a good move yesterday on volumes. The upmove could continue. Happy Trading. Readers, From the point I alerted, Nifty fell down my 150 points. Nifty still looks very negative. 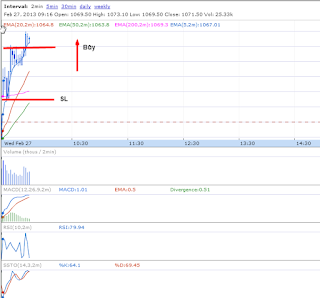 There is good support at 5880 and then at 5840. Overall most of the key stocks have entered into the negative zone, SBI, Tata Steel, Reliance, L&T all are negative and falling. There could be minor bounce backs , but only for selling. If 5880 is held, then there will be bounce back and short covering. Else, fall will continue. Please do intraday trading only in the direction of Nifty tomorrow. SBI again fell today with heavy volumes, stock is negative. Could go down to 2200 tomorrow. 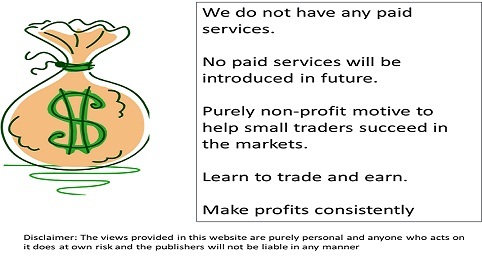 I have given numerous examples why we should not buy or sell on news. Market always moves ahead of news and traces back the move after the news comes in.See the example of how ICICI behaved on positive news. SBI looks further weak after today and is likely to continue its slide further. 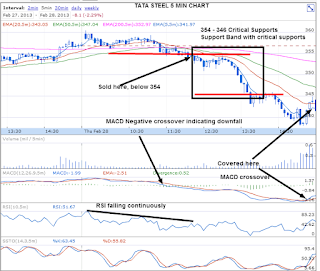 I had written several times before in the past few days that Tata Steel is very negative in charts. Today it fell down further with good volumes, some critical supports are broken. The stock could now go to 360. Short for intraday and positional. Volume picked up for Reliance. Again moving above days high will see further rise. 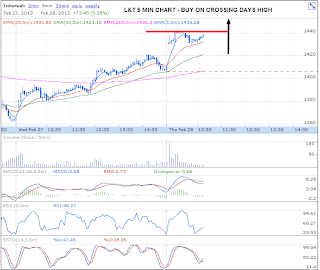 L&T may be bought for Swing trade for few days, since upmove is imminent as per charts. Read my earlier post on L&T here. Good point of entry for positional traders in cash/futures. Reliance is consolidating and moving up, if it crosses days high could move up further and could give few points scaling gain. Note that the upmove is not under high volumes, so do not expect a rally. I had given several sell calls for Bharti Airtel during the past few days and the stock was moving down continuously. Stock is showing signs of recovery in the chart and could bounce back. Buy for intraday. Yesterday only IT was in green. Today many sectors have turned green in the hourly charts, so there is an upmove possible on 13 Feb for many stocks. This could merely be a bounce back since the daily charts are negative for most. Readers, I have warned my readers several times not to trade on news. Majority of the times the trade will be losing since the market normally reacts ahead of the news and any knee jerk reaction will always be traced back. Below is the behavior of L&T today when IIP data was announced. I have seen several times in the past L&T bouncing back after negative IIP data. History repeats. Those who have gone short on L&T on the negative news had to square off on loss. Markets were very volatile today. Still could end up squeezing some profits from 3 trades. 1. 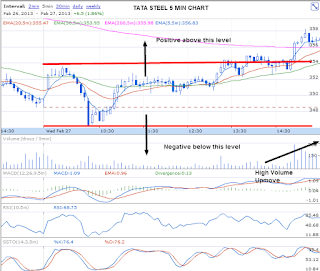 Tata Steel – My entry point was alerted here. 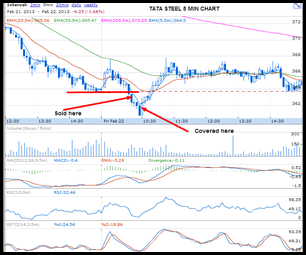 Subsequently Tata Steel fell by 3 points. 2. SBI – Was weak and sell call was given here. SBI fell down and covered with 5 points profit. 3. 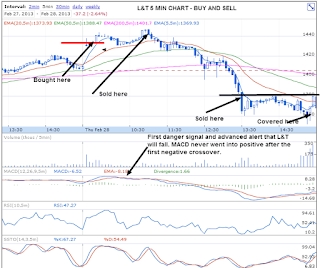 L&T was bought today, but SL triggered since stock reversed it gains and went to negative. I entered into buy position in L&T since the stock was showing positive divergences in the 5 min chart from previous day and a bounce back was expected. However due to volatality due to IIP, stock fell down and later recovered. SBI is showing negative signals in charts on sustained basis. If the current support line is broken (see chart), the stock will move down. 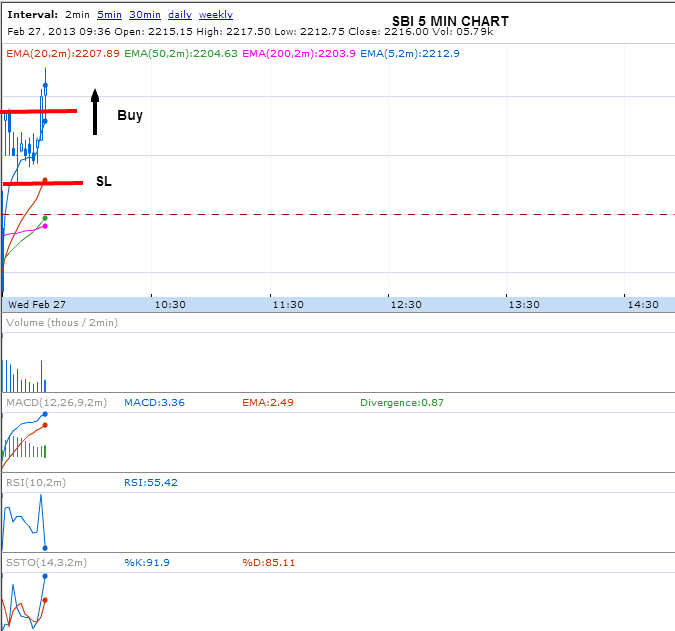 Trade for intraday. Markets will be volatile for first half. Indicators giving positive signals in 5 min chart. I wrote about Tata Steel here in my earlier post. 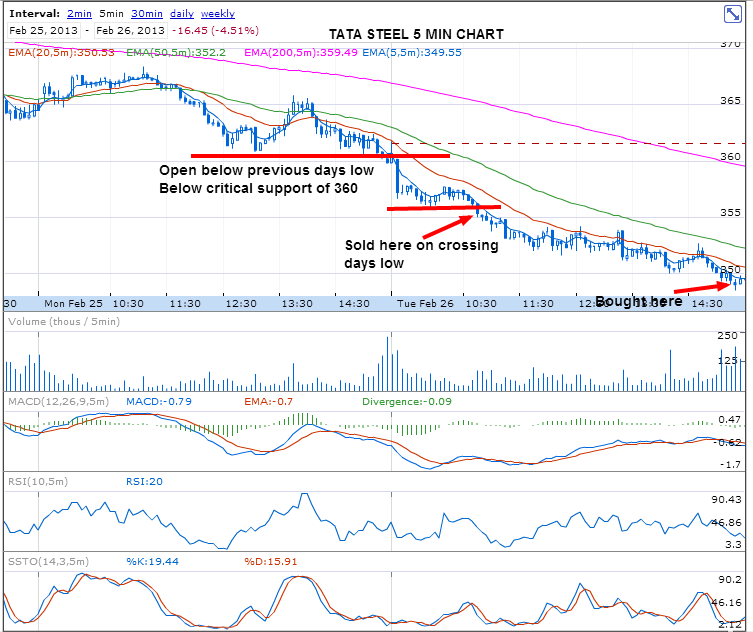 Today Tata Steel made several attempts to cross 388-390 levels but was not successful and fell down. Downtrend is likely to continue. If the stock crosses this level, will shoot up for few points. Below the level the stock will be negative. 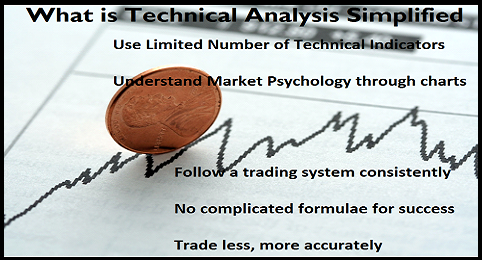 Analysing the sectoral trends every day after market close gives an idea of which sectors to trade the next day. Sectors which show the same trend on hourly and daily charts are good candidates to select for next day. After market opening, if the same trend continues in lower time frames, 30-15-10-5 min charts, better to trade in the same direction. Sector trends will also give an idea on which sectors will react first on a market reversal next day. For example, if market turns positive on Feb 12, Pharma and Banking will recover first. Most of the sectors are still negative. Only IT is positive in daily charts. Pharma and Banks are showing some kind of resilience. To see my earlier sector analysis click here.